Blogger.com is very popular platform by Google where you can own a free sub-domain and start blogging free of cost. You don’t need to purchase any domain or hosting package. Think in which sector you have sound knowledge, may be Travelling, sports, Driving Bikes, Collecting Stamps or Coins, writing stories, product review, writing recipes or even you can be good on science fictions. Whatever you can, just try to write blog posts on your blogger site. Do not copy paste, write good contents. Update regularly with a routine like daily or weekly or even monthly. When you will have some very good content then go to your Dashboard and click on Earning. You will get Adsense there and click in Sign up for Adsense. Now start earning through Adsense. Put Ads in your blog and earn revenue through views and clicks of your blog visitors. If you have your creativity in writing and if you think you can have some unique ideas then start writing a book. You can also submit your academic thesis or personal studies but remember content of your book should be creative from every angle, and then only it could have good customers to buy. That’s it you will get profit every time when people will purchase your book from Amazon. Now start selling your books from here. You can earn huge if you have passion in photography. Lots of websites waiting for your photo/photo album and it’s their headache to bring customers towards to photo. You just need to take such photography which people will feel interest to buy. If any people Download or Print your Photo then every time you will get royalty commission. Websites like Sutterstocks, Fotolia, Dreamstime, iStockphoto, BigStock Photo, Stockxpert, 123 Royalty Free, Crestock, Cutcaster and so on. If you can provide some services like web design, graphic design, SEO, Content writing, email marketing and some others like this, then go through the sites like Fiverr, Fourerr,Gigbucks etc. Open some gig there and sell your service. Add some portfolio of your service, images, jobs you have done before with the rates and see people calling you for help. Fiverr.com is a cool site for mini gigs for $5 each. 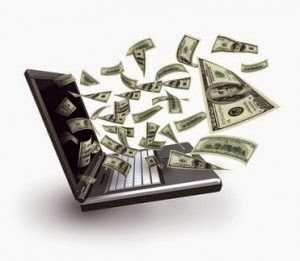 Lots of website providing affiliate earnings. E-commerce websites like Amazon, ebay and some others have their affiliate program. If you refer people to buy their products you will get commission. Some also provide cash back service on shopping. I am writing some example website’s name where you can refer people and if they register and buy some products you will get Money. Spotted Fox is a deal site that provides $5 for every referred sign up (for limited time) by you and $5 for every purchase. In Zozi you will get $10 for your referred person’s first purchase. HomeSav, Bloom, Zulily and Adore Me like this. Once upon a time online surveys were very popular when blogs, PPC, Paid posts were not so popular. For some scam and rumors it lost it’s market but some real income generating survey websites still on Internet. Remember quit from the sites who demand money for registration. Sites like Survey Spot, My servey, Minds Pay are few of them. You can search more in Google but remember before deciding to work check also the scam list or search with the name of the site for which you will work. If you get some scam news; avoid that site. Why do you waste your time by playing games which don’t provide you money and just kill your time? Yes, some of the games companies pay for playing their game. Games like Swagbucks, Zoombucks, Instant Cash Sweepstakes are few of them. Some Music based websites provides money from reviewing their Tracks. Soundout.com is one of them, just play a song and listen, rate the song and write an honest review. That’s it you will get 5p for every review. Experienced reviewers could earn 25p per review. slicethepie.com, MusicXray, RadioLoyalty, Hit Predictor are some of them. Social networking sites are not remaining like socializing only. It has creating some opportunity to earn money nowadays. You can earn from large fan page where you can post advertisement on timeline from people. You can earn from Twitter, if you have huge followers then you can post sponsor tweets. I will write a post later about the detail of earning from twitter. For today all these are few of many ways of earning from internet. If you like the post and you think I should write some more tips about online earning then comments here.